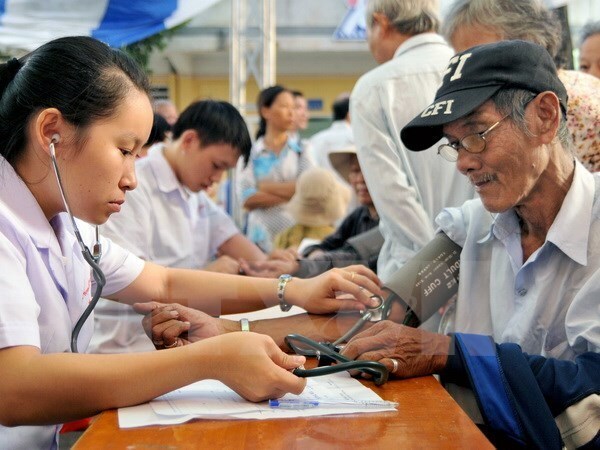 HCM City (VNA) – Representatives of the 21 Asia-Pacific Economic Cooperation (APEC) economies discussed investment in dynamic and healthy aging for sustainable growth at a multilateral forum opened in Ho Chi Minh City on August 15. The 250 participants were parliamentarians, government officials, experts, researchers and businesspersons from the APEC economies and international organisations. The forum took place on the sidelines of the third APEC Senior Officials’ Meeting and related meetings. Chairing the event’s opening session, Vietnamese Minister of Health Nguyen Thi Kim Tien said population change is currently one of the biggest demographic changes in the world with the rapid growth rate of old people, generating major opportunities and challenges and impacting all economic and social aspects of each country, community and family. The forum allowed policy makers, management officials, scientists and relevant parties to seek solutions and concrete and practical actions to invest in dynamic and healthy aging towards sustainable development in each economy and prosperity in Asia-Pacific. Keizo Takemi, a member of Japan’s House of Councillors and Chairman of the Asian Forum of Parliamentarians on Population and Development, said population aging has become a regional issue that needs close cooperation among multiple parties to work out solutions and actions. The forum provided a chance for economies to promote cooperation in carrying out multilateral solutions and public-private partnerships to build a healthcare network for the elderly and help improve life expectancy and health, so that the elderly can continue to work and ease the economic burden on younger people. The APEC economies account for 40.5 percent of the global population, nearly 50 percent of which are the elderly. Most of the APEC members are facing challenges posed by issues of the elderly, especially the economies with big numbers and rates of old people such as China and Japan. Vietnam has more than 10 million old people, accounting for 11 percent of its population. As a country with fast population aging speed, the elderly can make up 18 percent and 26 percent of the country’s population in 2030 and 2050, respectively.